From the construction of the first Whitehead-type torpedo used during the Spanish-American War, through the creation of the first SCAMP line during the Vietnam War, Bliss Munitions Equipment has a rich history of innovation while exhibiting itself as a predominant leader in the defense industry. Bliss Munitions’ Whitehead-type torpedo became the standard torpedo used during WWI. They manufactured a full array of ammunition presses that helped win WWII. During the Korean War, Bliss developed high-speed 20mm aircraft machine guns, 90mm cartridge cases and a knuckle joint press for 105mm cases for howitzers. Through the Vietnam War, Bliss built the first SCAMP line (Small Caliber Ammunition Modernization Program). 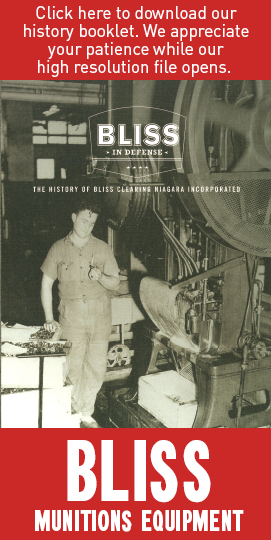 In 2013, Bliss initiated the modernization and redesign of its historic munitions machines to create the Bliss A Series. In 2018, Bliss introduced the Bliss 220A/260A Presses, the first machines that complete all pistol and riffle case post draw operations in a single press. Bliss is focused on continued innovation of high performance machines that will lead its legacy well into the future.